Measure the width of the image. The size of the picture light should be one size smaller (or the closest smaller size). 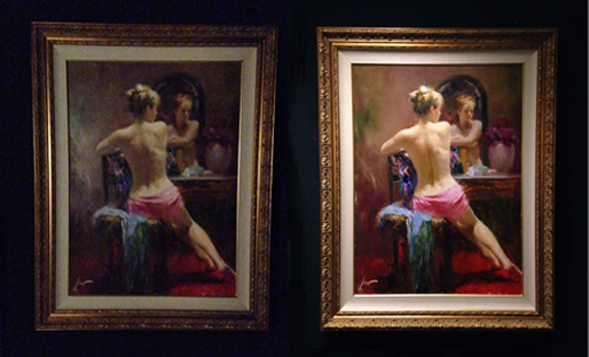 For example if the painting’s image is 18 inches wide, you should select a 16 inch light. 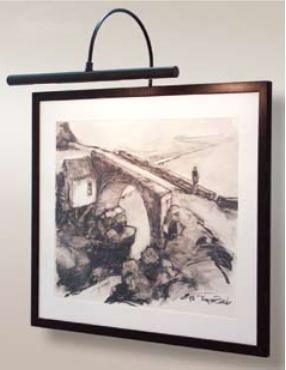 A wide variety of finishes are available and the selected light should blend in with the finish of the frame. Again, look at the image and its frame and determine if they are traditional or contemporary. Picture lights come in traditional shapes and slim line shapes that are more contemporary. 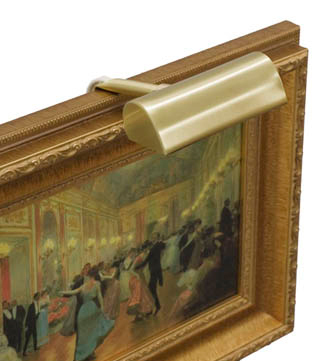 If there are no outlets available near where the painting is hanging, you can select a battery-powered one. The picture light company we use offers battery-powered lights up to 14 inches and they generally last up to 80 hours on a charge. Andy McAfee, our long-time gallery director, is an expert on lighting and is always happy to advise you on putting your art in its best light. Give him a call at the gallery at 336-855-8500 or toll free at 1-888-336-3736.